Tufail et.al conducted an independent, observational study of 20,258 consecutive patient visits comparing three automated DR screening systems: EyeArt, Retmarker DR, and iGrading. Adnan Tufail, Caroline Rudisill, Catherine Egan, Venediktos V. Kapetanakis, Sebastian Salas-Vega, Christopher G. Owen, Aaron Lee, et al. “Automated Diabetic Retinopathy Image Assessment Software – Diagnostic Accuracy and Cost-Effectiveness Compared with Human Graders.” Ophthalmology 124, no. 3 (March 1, 2017): 343–51. https://doi.org/10.1016/j.ophtha.2016.11.014. Adnan Tufail, Venediktos V Kapetanakis, Sebastian Salas-Vega, Catherine Egan, Caroline Rudisill, Christopher G Owen, Aaron Lee, et al. 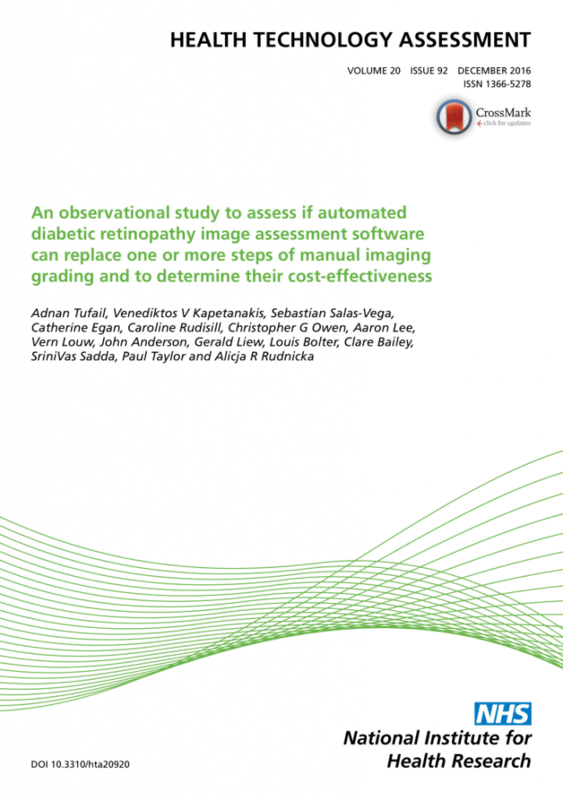 “An Observational Study to Assess If Automated Diabetic Retinopathy Image Assessment Software Can Replace One or More Steps of Manual Imaging Grading and to Determine Their Cost-Effectiveness.” Health Technology Assessment 20, no. 92 (December 2016). https://doi.org/10.3310/hta20920.